I love to cook and that love has passed on to my daughter. My 15 year old refers to our kitchen as her kitchen and she has even gone as far as to ask for new small appliances for Christmas (hand mixer, blender, etc.). We love that she enjoys cooking and baking. Cooking with my kids has always been fun. Yes, I know, the mess can get out of control when you invite little ones to cooking time. But the memories are so worth it and I love that they learn so much. When learning to cook, they are learning math and science as well as learning something they will in fact need when they get older. So why not let them cook with you? Young cooks and their adult assistants will find the recipes for beverages, meals, sides and sweets and treats. The Berenstain Bears Holiday Cookbook makes a great gift. Pick up the ingredients for one of the recipes and include the book and a family will be blessed with a fun gift. Or pick up the book for your own kids. 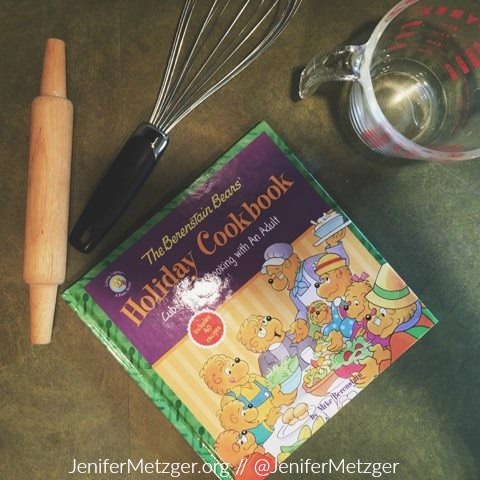 Check out The Berenstain Bears Holiday Cookbook!